Yep. You read the title of this post correctly. 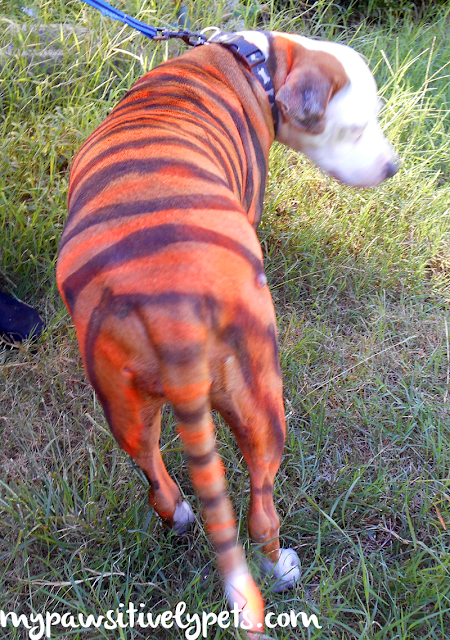 I painted my dog to look like a tiger. I used a pet safe spray paint called PetPaint. I was offered a chance to test out the product for an honest review and I thought it would be fun for Halloween. Well, it definitely was a fun time and a good experience too. Don't worry, this isn't a real tiger - just a dog. When trying to decide what exactly what I was going to paint on Shiner, I quickly thought of a tiger. Why? Well, because Shiner's already an orange color so I thought it would be easy for a novice pet painter like me to just spray on some black stripes on her body. I received some black and orange paint from PetPaint. I didn't use too much orange and mostly stuck with the black. 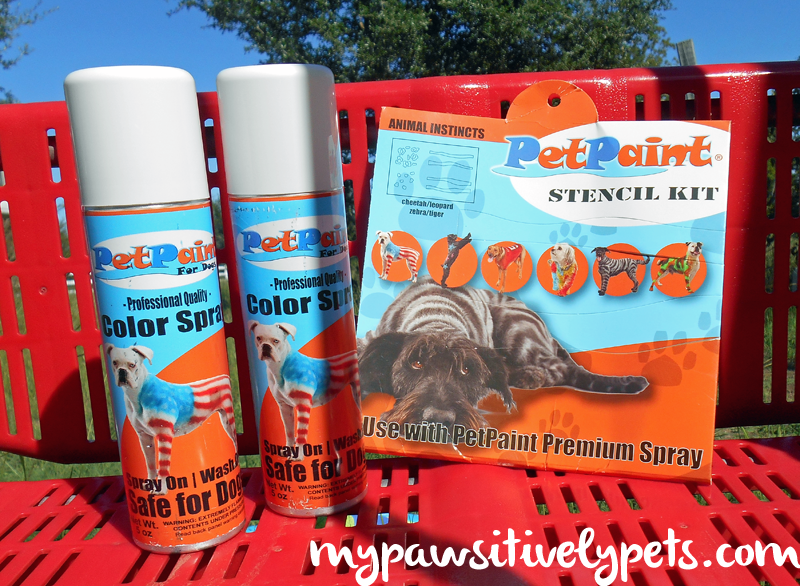 PetPaint offers stencils to make the task of painting your dog easier. I used the Animal Instincts Stencil Pack to paint the black stripes and just freelanced the orange stripes afterwards. 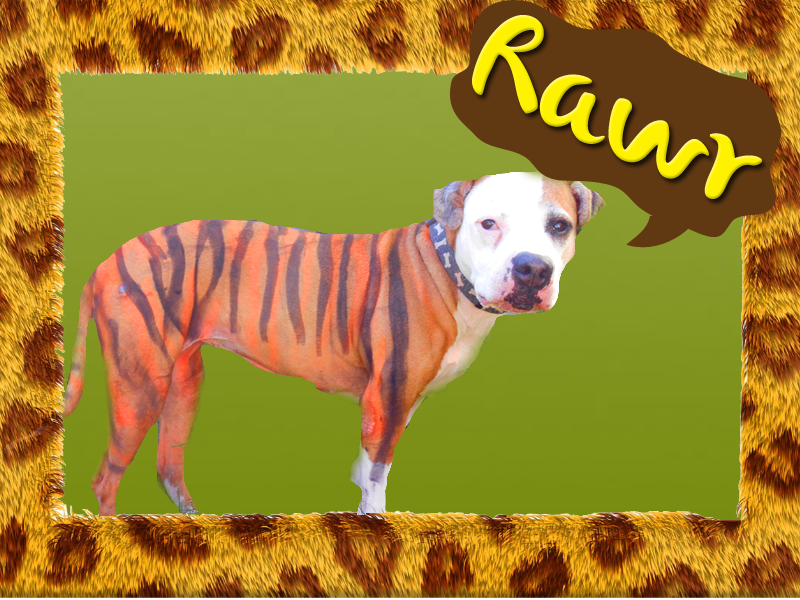 You can use this stencil pack to turn your dog into a leopard, cheetah, tiger, or zebra. I will say that I guess I expected a little more of the stencil pack. The stencils are just made of cardboard and I'm not sure how much they can be re-used. I guess I was expecting maybe some sort of bendable plastic? But they were still very helpful in painting on the stripes. I'd hate to see what Shiner's paint job would have looked like without them. A rear shot of the paint job. Shiner was good while being painted, but I kept her on a leash because I was afraid she would run off and roll around in the grass during the process. This paint wears off quickly and was pretty faded the next day. And it was super easy to wash off the dog and my own hands. PetPaint is an easy to alternative for dogs who hate wearing clothes and costumes on Halloween or other holidays/events. It's veterinarian tested, non-toxic, and professional quality pet hair dye. Plus, it washes off easily. It can also be used on cats and horses. It was a fun experience and everyone loved Shiner's new safari look. Visit PetPaint to check out all of their colors, stencil packs, and how-to videos if you're interested in painting your dog sometime! I'd recommend PetPaint if you are looking to spice up your dog's look for the day. Have you ever painted your pet? Would you ever paint your pet? 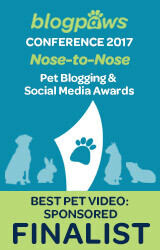 Disclosure: I received the products in this post at no charge from PetPaint for an honest review. I received no other compensation. All thoughts and opinions are my own. This post does contain affiliate links. Shiner looks very cute as a tiger!! I think my kitties would be too freaked out by the spraying of the paint to paint them, but it's definitely a cute idea for those who don't like dressing up. I'm not so sure how easy it would be to do a cat either. Shiner will be sending hers in today I think Mollie! He is way too cute! Did the color rub off on furniture or the floor when he was in the house? Not really, Spencer! That's one thing I was worried about. I noticed one time she whacked the tip of her orange painted tail against a couch and I saw a spot of orange. But I rubbed it off and it's not there anymore. Wonderful, thanks for the update! Well, Shiner does look pretty cute. I think you did a good job! Welcome to the Land of the Feline Shiner!!! What a creative way to have your pet stand out among the crowd...or dog park! Hee hee Shiner the Tiger. Cute! Oh of course! Definitely only using safe stuff for her. A co-worker of mine used to dye her dog for Halloween every year and he was always green or blue for like 6 months I swear! She always used pet safe dye, but still that is a very long time. So glad you did this review, I've been looking at this paint of a while. You have answered the questions I had about this paint. I'm surprised that the stencils are cardboard, wasn't expecting that. Now the only thing I wonder about is how long would this paint stay on a long haired dog. Glad you found it useful Linda. I liked the paint because it's not too long lasting or hard to get off. But if you're going to use it I suggest painting your dog the same day. I saw this paint on an an online halloween store! I thought about getting some, but then wondered what it would do to my house. I might have to order some next year! Thank you! Sure guys, it was lots of fun. It you're worried about it getting on your furniture I think you could easily give your guys a quick bath after your event was over. I think you did a great job on Shiner, and you did pick the right thing to go with....the tiger stripes seem to blend in well with her natural coat color. I don't dress up my dogs, and probably wouldn't do this either, but I think it's a great idea for people that want to dress up their dogs and don't get cooperation. Since it's non-toxic and perfectly safe, why not? Thanks Jan. 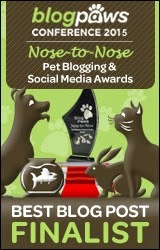 There are so many doggy events going on I think this stuff is perfect for year round things. And you don't have to go all out and paint tiger stripes, but you could always do a little heart or something. Oh my goodness. that is adorable! Shiner looks SUPER cute and it is perfect for the Detroit Tigers. I actually would never paint Dakota, I think that would work best on short haired dogs. Dakota's fur is WAY too dense and long and to be honest, I don't want to wash him afterwards! Thanks Caren! Shiner would be happy to cheer for your Tigers :) I'm also unsure how this stuff would work for long haired dogs like Dakota. Might be a little more complicated, unless you just wanted to paint him all one color or something. That is soooo cool! You did such a good job Ann! Shiner is now the most ferocious beast of the jungle! I always wanted to experiment with kirby and paints and now I know of the perfect stuff to purchase! You'll have to share what you do when you do it! Whoa! Shiner is a good sport. He's more easy going than I am, that's for sure. You did a great job on the tiger stripes. This paint is a good idea. Omgosh Shiner looks so cute as a tiger. If I ever got my hands on those paints, Beamer would hate his life. Lol! He would make a good tiger too. You could just use the orange to paint some stripes. Aw I think you would make a cute little zebra PB. Or a giraffe, but I think a giraffe might be out of my skill level of dog painting lol. He he! You did a great job - Shiner looks pretty cool! Aw!!! that's a cool paint!! I never paint my turtles for many reasons but I would love to as long as the paint is safe...just to see how they look in color, take photo and then erase it. Thanks guys :) This paint is safe for all furry animals, but I don't see anywhere on the website where it talks about our reptile friends. I'd still be careful. And I loved your post about not painting turtles! I want to do the tiger stripes on my 4lb Chihuahua , how would you recommend I go about doing this project on such a small canvas? Well, I think you could probably go about it the same way as I did. You could always use the stencils from PetPaint, the stripes aren't that big. You'd just have to space them out more. Or you could probably make your own smaller stencils if you wanted. Good luck! Thanks! I'll post a pic of what it turns out like! Oh awesome I'd love to see! Hehe aw well it's the spirit that counts! ;) I think these are pretty cool for football too. They have a picture of a dog with a football jersey painted on him on their website. Oh Shiner, I hope you got lots and lots of treats! The stripes are rather pawesome! Someone said 'bath' and they said I could be a polar bear! Of course Clowie :) I think you would make the perfect polar bear! Very cute...lol. And poor Shiner...lol. so cute! shiner looks very well behaved through the whole thing! 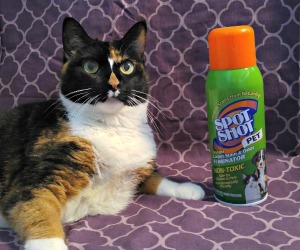 This is the best post for Pet Paint that I've seen. Pawfect for short furred dogs on Halloween who don't like to wear clothes. I'm in the same boat as Dakota - too furry, I have enough colors naturally, and long thick fur is a pain to wash. BOL! That looks really cool! Maybe my three would let me do that for Halloween since they hate costumes! I like to paint pictures and in looking for tips I accidentally came across this site. I am assuming that you are some kind of artist or animal person, but I just cannot believe that you did this to your pet. Animals are innocent and do not have a human's way of looking at things as you must realise if you are a thinking creature. How would you feel as a human if Shiner did this to you. This is just another example of animal abuse and contempt for a lovely animal friend. Hi Mike, I'm a veterinary nurse actually. If Shiner did this to me, I wouldn't mind. I think body painting is pretty cool. And I always loved having my face painted as a kid. My kids today also like to have their faces painted and getting fake tatoos. To be honest, Shiner enjoyed the extra attention and I don't think she even noticed that she was painted. The stuff rubbed off pretty easily. You probably didn't read that it was pet safe, but it is. But to each their own opinion. One bath, or more to get it off? Actually, This dog is look great after the painted. Great idea!! Well good for you! I wouldn't recommend painting a turtle. This paint does wash off very easily, but I'm not sure that I would use it on a reptile. I might contact the company if it's something you were interested in trying. Hi Ann Staub! 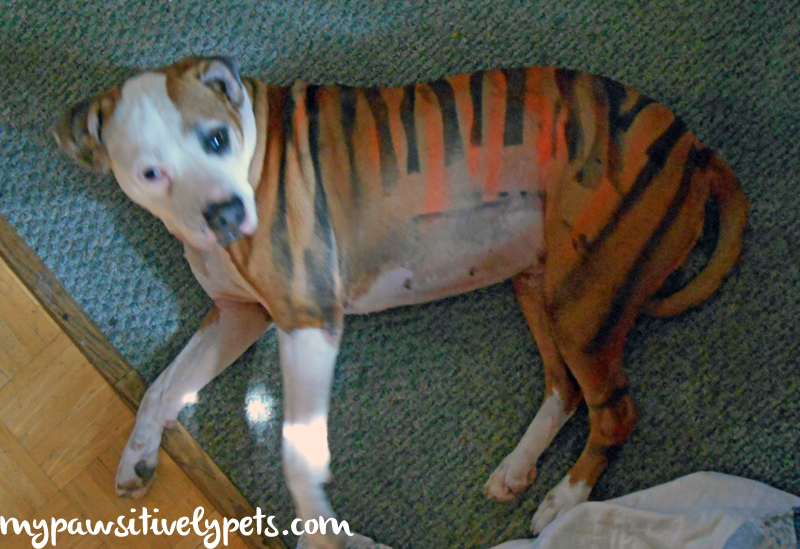 We loved this article and really appreciate how much you enjoyed painting your dog like a tiger. Keep enjoying your animals and we will keep making pet safe hairspray for them. Hee hee Shiner the Tiger. so cute! shiner looks very well behaved through the whole thing! Haha, Look your dog! Look like a tiger, real tiger! Magical petpaint.